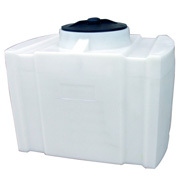 These low profile portable tanks are designed for economy and long service. Rectangle shape saves space and does not need stands or cradles for support. UV Stabilized for outdoor storage. Molded in 3/4" NPT outlet standard. Molded slots for tie down straps. Ideal for pick up trucks.